The New Bijou — It’s coming! For those who live near Beach. This winter: A quiet snowy street. The lure of a revived movie theater comes with a lot of sweat and volunteer help. Just ask Nick and Sarah Hegel. Once it was a showcase of a showhall, but the building sat empty and unused — it got moldy and damp, partly because the roof leaked so badly it destroyed they once fine seats. They bought the Bijou Show Hall back in March of 2018, and then step by step faced and conquered mountains of obstacles like moldy seats. It’s a challenge, never-ending repairs face the couple and their children who have invested countless hours laboring remodeling the building. When the cost of repairs started exceeding their budget, Nick and Sarah turned to the community. People in Beach turned out on a cold winter’s night for a fundraiser at the Backyard Bar and Grill. Fundraiser at the Backyard Bar and Grill in Beach. The community support for their remodeling is encouraging. They had to go to Wisconsin to get new theater seats to replace all the oldy-moldy seats. The projector system that was in the theater was good and useable, but the industry changed its standards, so they bought a $25,000 projector system. Sarah tries but falls short of being able to explain why she and Nick bought the theater. “I don’t know. It just drew me in,” she says. The goal is to be done with remodeling and open this spring, to give youngsters a form of entertainment — and a place to work. You can follow their progress on their Facebook page. From doors to floors, fixtures to furniture, they’re documenting their progress on Facebook. Beach has a new energy about it. Not only does Prairie Fire Pottery draw in people, but the eateries, including the Golden Valley Outfitters, are attracting people. They are raising the energy level of this town on the edge of the energy industry of Western North Dakota. There’s more family fun coming to Western North Dakota with a planned Renaissance Fair this summer. We’ll tell you about that. 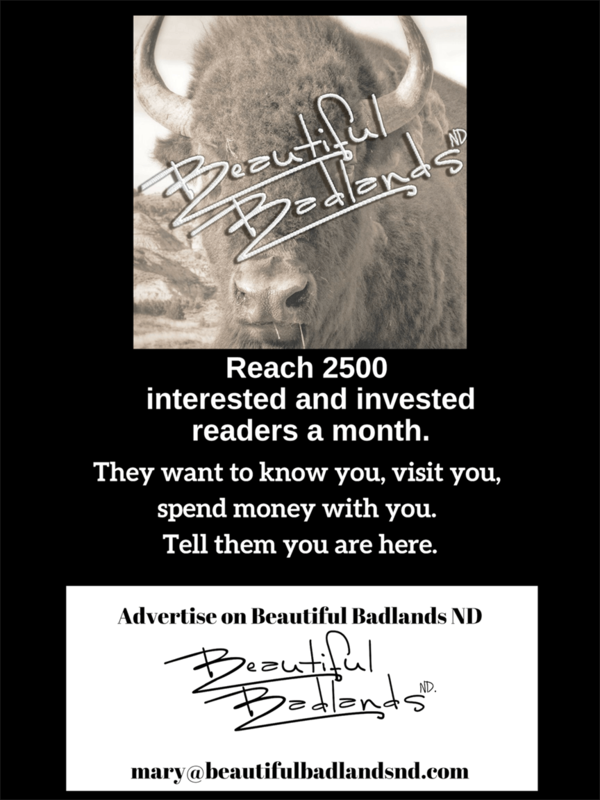 Stay up to date all winter with the beautiful Badlands of North Dakota. Subscribe in the upper right to get a notice in your inbox when a new story is posted. You’ll also get, for free, the twice-a-month newsletter. We’re booking speaking engagements for this winter and spring. For example, two of our upcoming events are February in Watford City, June in Medora.